Join us as we show you how to improve efficiency as well as save time and money with digital. 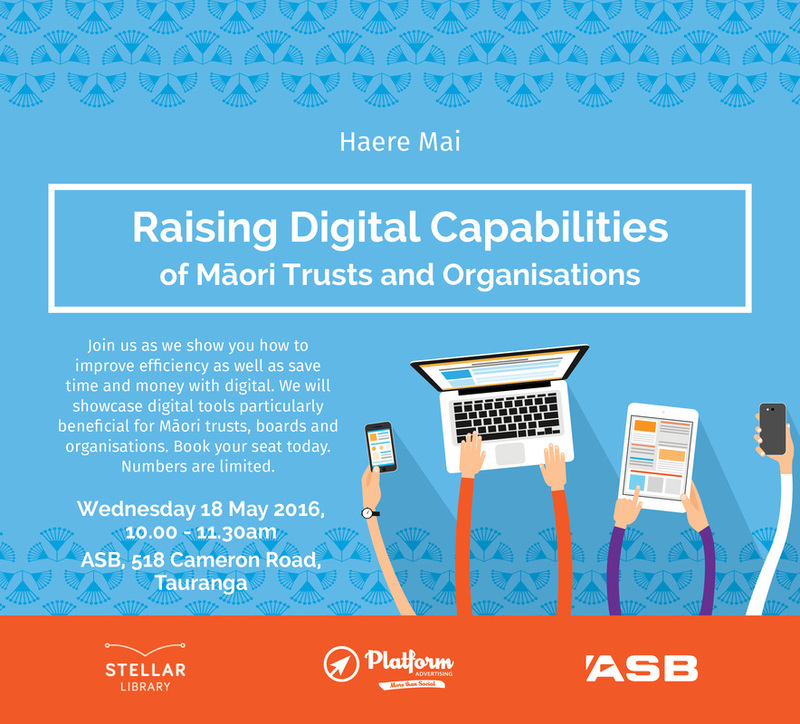 We will showcase digital tools particularly beneficial for Māori trusts, boards and organisations. Book your seat today. Numbers are limited. Ko Duncan Mckenzie toku ingoa. As the national sales manager for Stellar Library, I am excited to be helping Maori organisations in our area become more tech savvy in and ever changing digital world. Stellar library helps our people distribute their trust and board papers to their members in an increasing paperless meeting environment, securely and up to date. Our software solution is future focused and helps Iwi and businesses save time and money. Stellar Library is a mobile document library system for tablets. Our simple and intuitive cloud based software gives you complete control of all your confidential, operational and sensitive documents for your organisation, while also simplifying your workflow. This is going to sound cheesy but I founded Platform Advertising on Valentine’s Day 2013. Of course, I didn’t realise the significance of the day at the time, but building this business from the ground up has reminded me of how much I love this industry. I had a desire to create an Advertising Agency that was more. An Agency that cared more about its clients and their business. An Agency that cared more about its people. An Agency that was at the cutting edge of innovations in digital communications but was more than social. ​With a Bachelor of Management Studies and a Post Graduate Diploma in Business Marketing, I had spent over 15 years in senior management, including 4 years with Fairfax Business Media and most recently 7 years heading Tauranga based advertising agency, Adcorp NZ. I count myself blessed every day I get to work in this industry and live out my dream job, meeting diverse and interesting people and helping them revolutionise their businesses. I feel fortunate to have been able to return Tauranga, my hometown to share with my husband and 5 year old son the amazing lifestyle on offer here. Anthony has a finance background and has worked extensively with iwi and Māori organisations in Aotearoa. He is the Head of the Māori Financial Solutions team for ASB and has worked for more than 20 years in the Financial Services industry. Anthony has experience and skills in structured finance and bespoke banking solutions for clients, ranging from small not-for-profit entities to larger SME’s and also cross border multi-national organisations. He brings thorough knowledge and extensive relationships across the Māori Economy and its markets, to ASB. Anthony’s experience enables him to apply robust governance and investment disciplines in complicated stakeholder environments.